Description: The Balbalasang-Balbalan National Park and Banao watershed area in the Northern Cordillera is proof positive of the inherent capacity of indigenous communities in natural resource protection and management. Through the Banao tribe’s “lapat” tradition, the area continues to maintain one of the most extensive tracts of old growth forest in the country. The Balbalan-Malibcong area is generally characterized by rugged to mountainous topography, with elevation that ranges from 167 masl to 2,439 masl (1,303 masl on average). These municipalities are also endowed with rich mineral resources, which include iron, sulfur magnetite, nickel, gold, copper, and silver. The area’s natural physical features offer great prospects for eco-tourism. BBNP is considered as one of the Important Bird Areas (IBAs), one of the Conservation Priority Areas (CPAS), and recently as one of the 128 Key Biodiversity Areas (KBAs) of the Philippines. 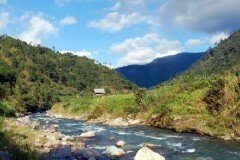 Still, it remains one of the least biologically explored portions of the Central Cordillera. This site falls within the northern Central Cordillera region, which features one of the most extensive tracts of old-growth forest remaining in the country. At least 105 Philippine endemics (including 37 island endemics) are found in BBNP. Eighteen (18) species that were recorded during the field survey are listed under either on the Philippine Red List (DAO 2007-01) or on the IUCN Red List of Threatened Species (2010). The most interesting species is one that was discovered during the Rapid Site Assessment (RSA) conducted in the Kalinga project site – the Rafflesia banaoana, the sixth species of Rafflesia recorded in Luzon. 65 vertebrate species were recorded during an RSA at Mt. Panogaan in Brgy. Balbalasang, Balbalan, Kalinga. Of this total, 14 are mammals, 50 birds, and one amphibian. Also out of this number, 34 (52.31%) are endemic species. Nine species found in the site – four mammals and five birds – can be considered of importance to conservation (i.e. listed as threatened in varying degrees). The mammals are the Golden-crowned flying fox (Acerodon jubatus), the Philippine warty pig (Sus philippensis), the Luzon Water Redstart (Rhyacornis bicolor), and the Philippine brown deer (Cervus mariannus). The birds are the Ashy Ground-thrush (Zoothera cinerea), Luzon Bleeding-heart (Gallicolumba luzonica), the Montane Racquet-tail (Prioniturus montanus) and the Rufous Hornbill (Buceros hydrocorax). Banao Watershed is being claimed as the ancestral domain of the Banao tribe in consonance with the Indigenous Peoples’ Rights Act (IPRA) or RA 8371. Territorial boundaries are shared with the Gubang, Mabaka, Binongan, and Masadiit tribes, a co-existence reinforced by the traditional system of Bodong (peace pact). Another indigenous system that is helping maintain the integrity of the site’s natural resources is lapat, by subjecting the gathering of any type of forest resource (not only pertaining to flora and fauna, but also the minerals, springs, and rivers) to the approval of the entire tribal community. Upland farming, including kaingin practices, as well as cattle pasture. Tree-cutting for lumber and other purposes such as firewood for hunters, trappers, and gatherers who spend nights out in the forest. The physical make-up of the watershed makes it prone to landslides, which threatens not only biodiversity, but also community infrastructure such as the mini-hydro power plant. Pollutants resulting from chemical-based farming, emerging industrial and mining activities, deforestation/land degradation, domestic and municipal waste, as well as naturally occurring events such as river sedimentation, landslides, and climate change effects. The growing population is threatening to cause further encroachment of forest lands for agricultural use to support production for subsistence and livelihood requirements. While this is a non-issue at present, the protected area status of BBNP and the ongoing CADT application may cause a potential conflict in the future in terms of who will have the ultimate responsibility of protecting and managing the area. Concerned Citizens of Abra for Good Government (CCAGG) & Malibcong Banao Bodong Federation, Inc. Helped clarify and re-establish protected area and ancestral domain boundaries for the Banao tribe. The 2007 RSA project rectified previous site assessments and helped establish a standardized method for data collection, compilation, and analysis of 19 out of 22 site-focused projects funded by FPE. The results generated by this project were intended for use in inventory and profiling, baseline monitoring, project development, and as a basis for formulating the Area Development and Management Plan (ADMP) of the FPE-funded sites. Revived and reinforced the practice and promotion of the traditional lapat system of natural resource management. Promoted the use of the watershed perspective in natural resource management planning. Awareness- and capacity-building for leadership training among the affected upland communities for systematic, effective, and sustainable community-based resource and livelihood management initiatives. Biodiversity monitoring tools and methods were also introduced among local partners. Assisted LGU and PO leaders in writing proposals, accessing external resources, and crafting area-specific and organizationally responsive operational plans for natural resource management. Established new and strengthened existing local partnerships toward effective IP-LGU governance systems. Raised awareness on critical environmental threats such as mining concerns and other excessive resource extraction activities within the local territory. Provided assistance and intervention among small-scale miners to promote and recommend cleaner and more sustainable technologies for their livelihood.